Paintings done in oils or acrylics. Anyway, I thought I’d share this painting, nonetheless. I did enjoy it, and I do think that it turned out nicely. A good change of pace for a bit. – Measures 5×7 inches. Painted on a canvas board. 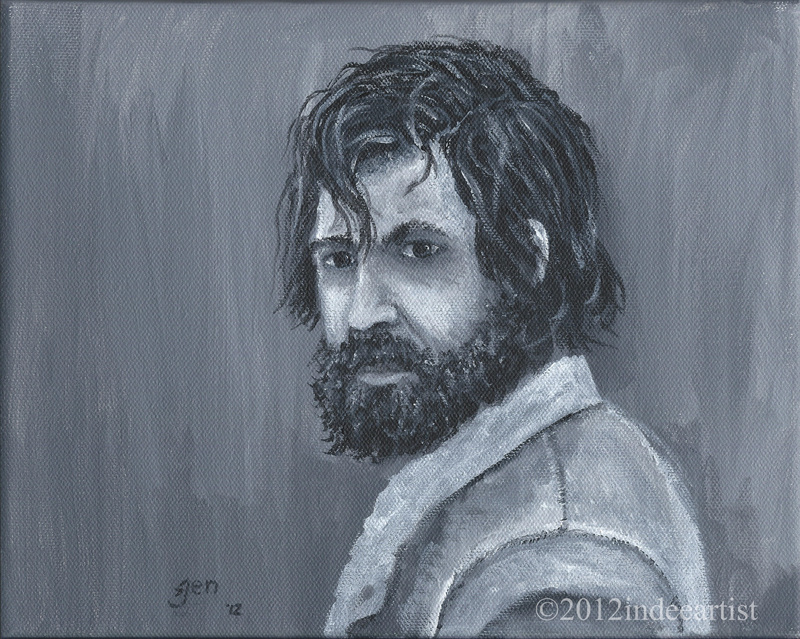 – Painted with acrylics, with a somewhat limited palette. Thank you for looking, and happy spring! Some of you may remember my new house cat, Norman. He’s been in the house for just over a year now, and is a wonderful – if sometimes naughty! – cat. I adore this guy, and he’s such a charmer. He’s got the wimpiest, squeakiest little voice of any cat I know, and he loves to play and roughhouse with my other wonderful cat, Oliver. Oliver is over ten years old now, and he and Norman are…for the most part…great buddies. They play and tumble and wrestle every day, and even are willing to share toys and blankets and beds. So since I’m currently working on a scratchboard of Oliver, I got the bug to do an art piece inspired by Norman. For as regal and stately as Oliver is, Norman is the clown with his antics and his silly little face. I don’t often paint…almost never, really. Maybe once or twice per year. But that once or twice a year, I simply must paint. 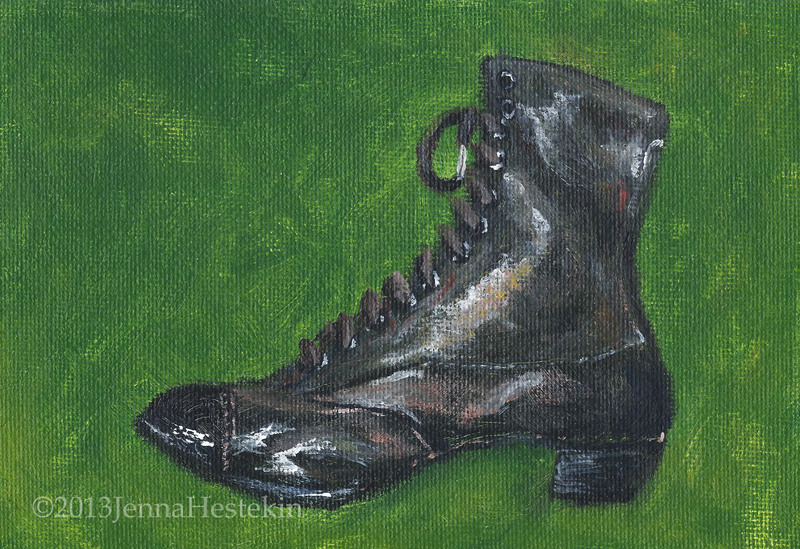 Acrylics are my usual choice in painting mediums, so this is an acrylic painting. I mixed gel into the paints for some whimsical textures. Norman is whimsical, after all! – 8×10 inch stretched canvas. 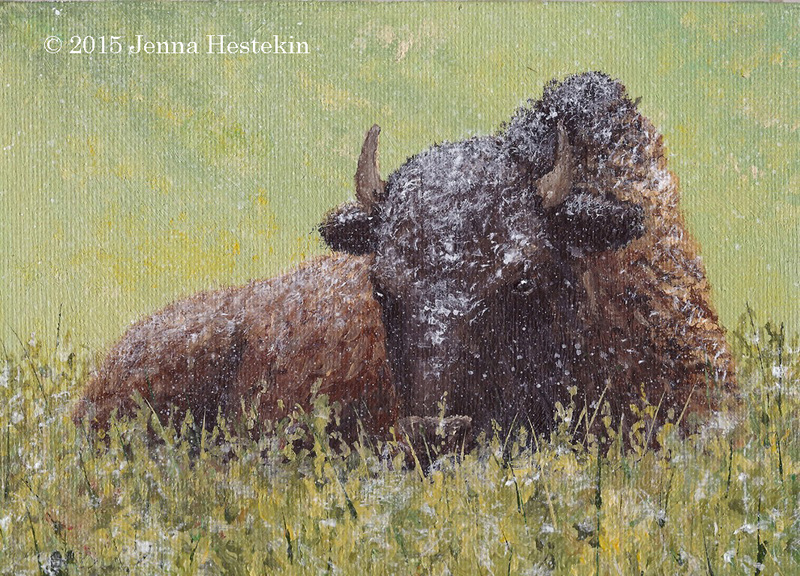 – Painted with acrylic paints mixed with gel to add gloss and texture. 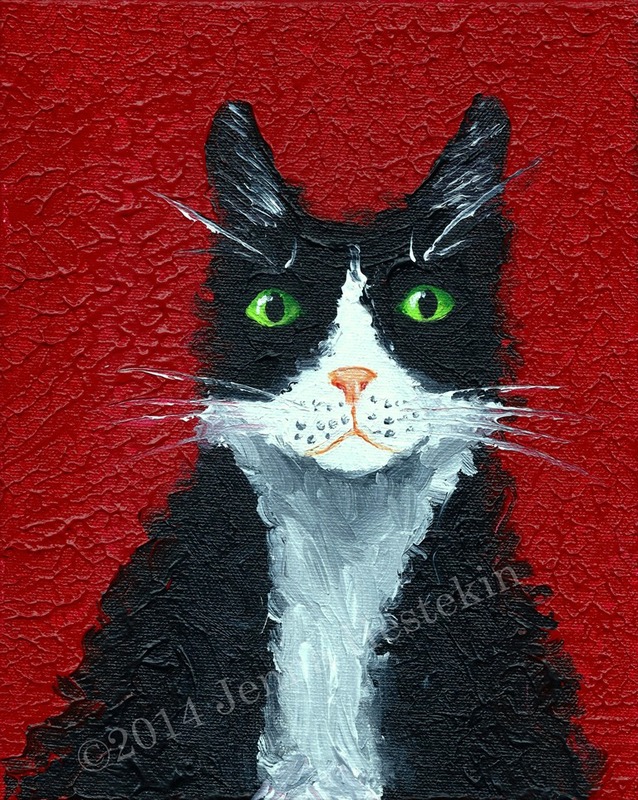 – Paint was applied mostly with knives, although I used brushes for some details such as the eyes, nose, and whiskers. After having such a nice time painting the little town of Alma, I decided to paint some more. 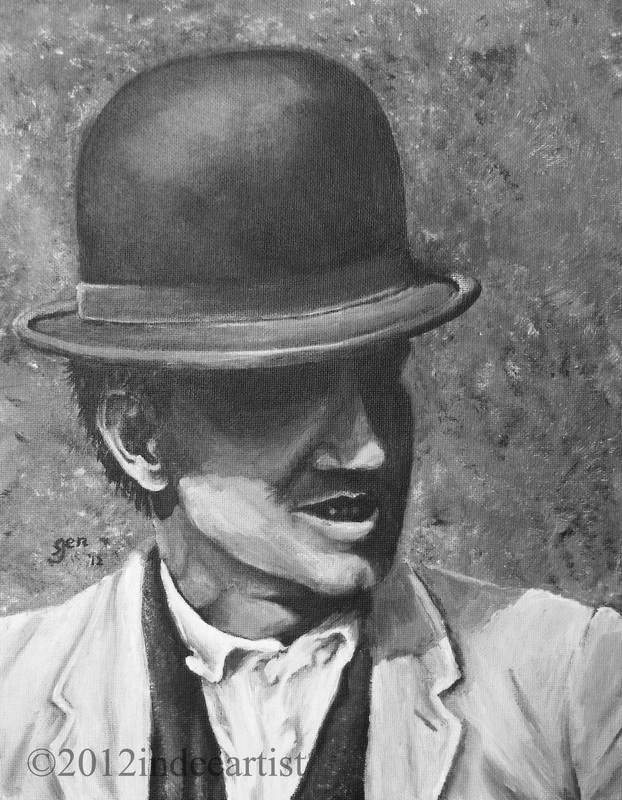 Black and white painting is something that I think I could really get into. I am still trying to think of a book cover idea. In my search for reference material, I found a photo of a man who seemed to look very much like how I would picture my book character, Zeke. If you’d like, you can get to know Zeke a little bit here in this old post. Once again, I was using acrylics for this, and I’m still a little afraid of color. Black and white media suits me for now. This one took about 2 and a half hours to paint, and in that time, I couldn’t pry myself away from the canvas. I don’t know that I’ve ever had fun with painting as I have with these most recent two. Rarely do I paint. Almost never, really. 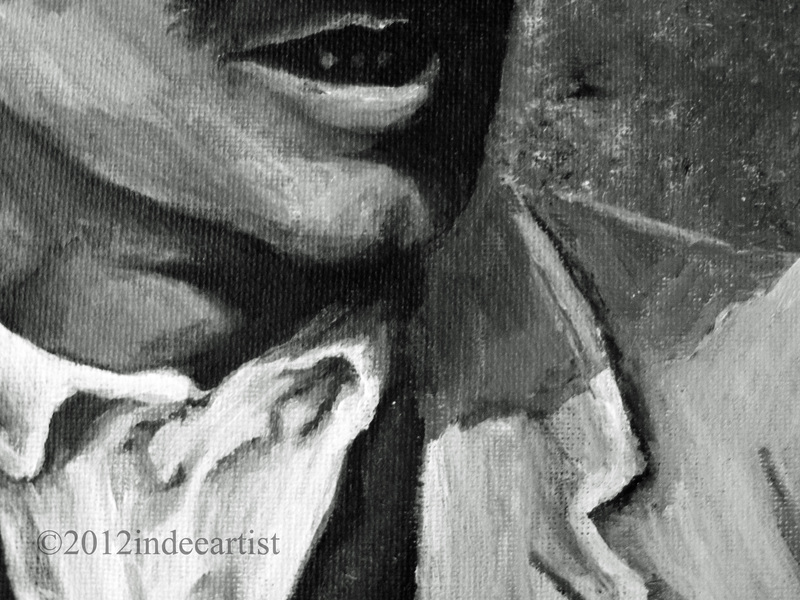 I would never set out to have one of my first artworks of 2012 be a painting…the odds of me keeping that simple resolution would be so slim that I probably wouldn’t dare make it. Sometimes, though, it just happens, and when it does, why fight it? A recent novel I’m working on takes place in the tiny historical town of Alma, Wisconsin. 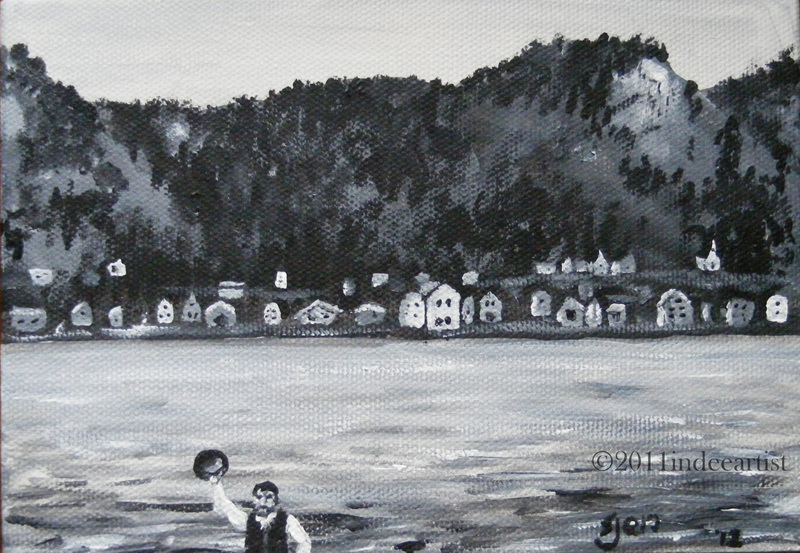 It is set in the year 1869 and is the result of my taking on the fabulous NaNoWriMo challenge in the November of 2010. This novel has needed a lot of reworking and in that process, there was much to learn about the history of little Alma. Half the fun of writing historical novels is the research that must be done. Oh, the research! All the hours of searching, thinking, studying, mulling over, considering and deciding! Fun, but yes, it can be exhausting at times. The novel was a something I poured my heart and soul into. I am, at last, nearing the finish of the editing (I hope! ), and I’ve been trying to come up with a unique, eye-catching cover illustration for my story. I’ve got some ideas, have some images I’d like to work from, and decided to start sketching out some ideas. After two little thumbnails of my cover ideas – neither of which I really cared for – I took my reference material to my studio where I could really think and toy with different ideas. …And in my studio, nothing came to me. I instead looked at an old, homely half-done painting I started ages ago. Just because the nature of the artist is often to procrastinate, I started playing with that ugly painting. When I got that out of my system (and only made that WIP painting worse, by the way), I looked at my Alma reference material again. 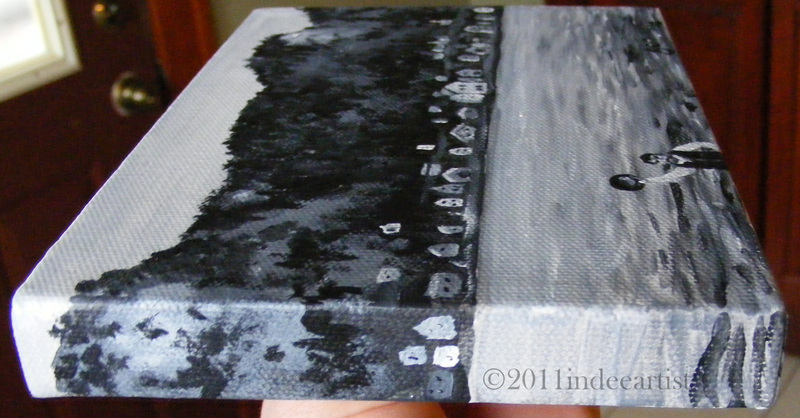 On a whim, I took out a 5×7 canvas and put some simple black and white acrylic paints on my palette. Just for the fun of it, I started painting this wonderful old photo taken in the year 1870 of Alma. I loved the whimsy of the man in the foreground waving his hat. Isn’t it a charming image? With this image tacked close by, I picked up a brush, dipped it in water, and loaded up some paint. Two hours later, this is what I had. While I likely won’t be using this for my book cover, it was somewhat inspiring to paint historical Alma anyway. It lacks some detail, and it’s somewhat simple, but I had a great time doing this. 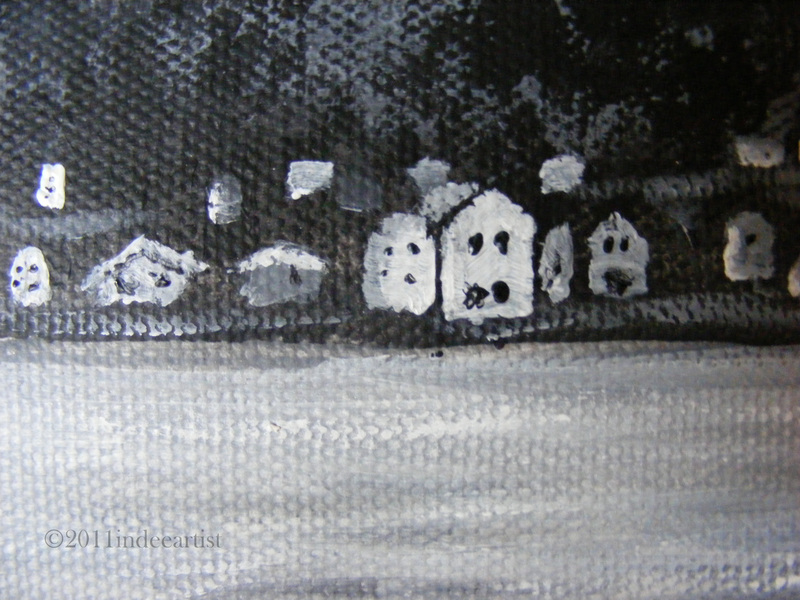 There was something so quick and spontaneous about the strict black and white palette, as well as the small size of 5×7. I had such fun with this, and that’s saying a lot for painting in my world. Click on the images if you’d like to see them larger. Inspired by some of the work I’ve seen recently in galleries, I painted around the corners and to the edges of the canvas so that this can hang without a frame and still look finished. 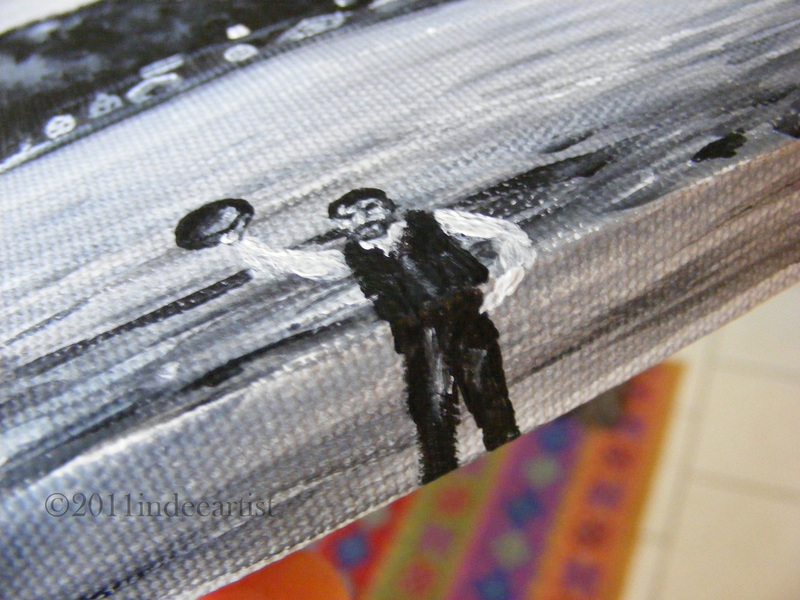 I debated painting the man waving his hat, but that’s what I loved about the photo, so I went with it.